Student Weekend Activities. Students can watch a Marvel Comics movie marathon this weekend, and participate in a hero costume contest in Marshall. Leading up to and in honor of Dr. Martin Luther King Jr. Day, there will also be a showing of the movie Selma. Students are also invited to participate in the 6th Annual Teen Peace and Social Justice Summit at William Tennent High School on Sunday. Full schedule. Parent Teacher Conferences. Conference scheduling for parents is now open. Conference Night will take place on Monday, January 28, and Conference Day will take place on Friday, February 1. Learn more. Course Selection Workshops on Conference Day. Planning a Course of Study will be offered for parents of current sophomores at 9:00 a.m., and for parents of current freshmen at 10:15 a.m. in the MDA Library Conference Room during Conference Day on February 1. Course selection for 2019–20 will start soon, so this is a good time to talk with your child and their advisor about next year’s choices, as well as their multi-year course plan. See the full schedule. Fathers Committee Meeting. On Wednesday, January 23 at 6:30 p.m., Religions Teacher Martha Holland will lead the Fathers Committee with a mindfulness exercise in the MDA Conference Room. Penn Travel Medicine Lecture for International Service Trips. Penn Travel Medicine will be providing a medical lecture for international service trips in the MDA Library Conference Room on Friday, February 1 at 2:00 p.m. Students on the Bonaire trip do not need to attend. Parents of participants in attendance who have vaccinations done through Penn Travel Medicine will have the consultation fee waived. For questions, please contact Steven Fletcher at sfletcher@georgeschool.org. Jan 23. Fathers Committee meeting in the MDA Conference Room at 6:30 p.m. Attention Parents! The GREAT GREEN GIVE is here and your participation is critical to its success. 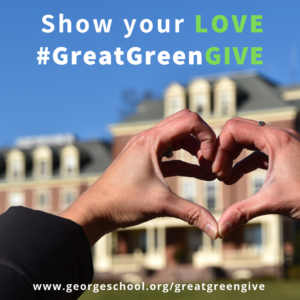 Show your GS love by making a gift and get us one step closer to our goal of 900 donors by February 8.